This Just In… British Airways launches its great big sale with thousands of flights in all cabins and hundreds of holidays on offer. The twenty day British Airways sale offers discounted flights to over 100 destinations worldwide as well as 100’s of holidays for various travel departures from August 26, 2010 right through to June 30, 2011. For a late summer getaway, hot spots include flights to Dubai, Antigua and Grenada. Those looking for ski breaks head to North America and experience the Rockies with deals on flights to Denver and Vancouver. For short city breaks, British Airways have a wide selection of destinations such as Zurich or Geneva. Travellers wishing to jet-off in style and experience British Airway’s award-winning Club World beds can check out flights toCairo, Delhi, New York, Bermuda and Calgary. BA also offers flights to Barbados and Houston that allow customers to take advantage of the luxurious first class cabin. Destinations closer to the UK include Jersey, Dubrovnik and Salzburg as well as Gothenburg in Sweden, which a new BA route takes-off to at the end of November. As well as special offers on flights, British Airways is offering value for money holiday packages in a variety of destinations such as a two night stay at the 3-star Merton Hotel in Jersey that includes return BA flights from Gatwick and accommodation only. Package deals at Sharm El Sheikh’s 3-star Oriental Rivoli also include return BA flights from Gatwick and accommodation only. A new BA non-stop twice weekly service to Cancun commences November 3, 2010 and customers can stay for seven nights at the 5-star Dreams Puerto Aventuras Resort and Spa in Riviera Maya including return BA flights from Gatwick and accommodation on an all-inclusive basis. Those looking for complete escapism can check out holidays in the Maldives and relax for seven nights at the 4-star Adaaran Select Hudhuranfushi including return BA flights from Gatwick, in-resort transfers and accommodation on an all-inclusive basis. British Airways offer fly-drive holidays in exciting destinations such as Orlando including return BA flights from Gatwick and inclusive Avis car rental. British Airways plc offers a wide range of worldwide destinations - including holidays, hotels, flights, car hire and experiences. 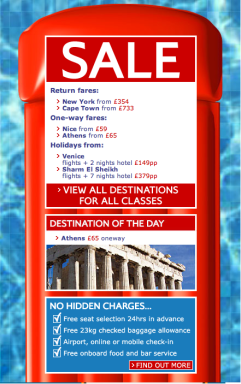 Customers can save time and money with ba.com when booking ATOL protected holiday packages, ATOL number is 5985. Passengers are offered added peace of mind to their holiday plans and the security of travelling with British Airways. British Airways plc constantly seeks to exceed customers’ expectations, both in terms of the value for money and quality of the service provided.